Opera fans have a lot to be excited about with OperaDelaware's production of L'Elisir d'amore (The Elixir of Love), Gaetano Donizetti's comic two-act opera, with two performances at The Grand on October 11 and 13. 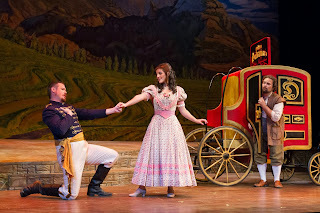 Conducted by Maestro Jerome Shannon, with a truly stellar cast of performers, including rising star tenor William Davenport, nationally-known soprano Sharin Apostolou, and Metropolitan Opera baritone Trevor Scheunemann, L'Elisir d'amore will not disappoint those who already love the genre. For those who find the idea of the opera intimidating, L'Elisir d'amore is also the perfect opera for new fans, because it's just really a lot of fun, with fast pacing, a clear storyline, romance and lots of laughs. Of course, the music is stunning, with Davenport and Apostolou leading the story of a young man and woman playing the game of love. The tale centers around Nemorino (Davenport), and Adina (Apostolou), who have known each other since childhood, though Nemorino is poor and Adina is from a higher class. Adina loved Nemorino as a little girl, but young Nemorino blew it when he found himself distracted by a baker passing with fresh pastries. That fateful doughnut would follow him to adulthood, when beautiful Adina, all grown up, shows little interest in him -- or anyone in particular, really. When she is courted by the flashy soldier Belcore (Scheunemann), Nemorino confesses his love to her, she tells him that true love doesn't exist, and he should be like her and date around. 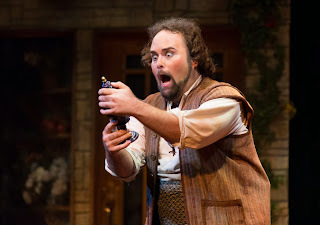 A scammy traveling salesman, Dr. Dulcamara (Stephen Eisenhard, basso buffo), sells Nemorino a phony love elixir. His behavior after drinking the elixir starts to intrigue Adina, she decides to make him jealous, leading to a comical chain of events as the couple tries desperately to get the other to fall in love with them. Don't worry if you don't speak Italian -- the opera is subtitled on screens on either side of the stage. Every aspect of the opera, from the magnificent stage sets to the lush costumes, come together to create an experience that's as magnificent visually as it is to the ear. Bring the family, bring your friends, but don't miss this one-weekend-only event. For tickets, go to operade.org.